Get Set, Go! Phonics, a six-book series, jointly written by Professor Linda Siegel, Professor Emeritus at the University of British Columbia; Dr Susie Russak, Head of the English Department at the Beit Berl Academic College; and Dr Richard Wong Kwok-shing, Assistant Professor in the Department of Early Childhood Education at The Education University of Hong Kong (EdUHK), won the 2018 ELTons Awards for Innovation in English Language Teaching in the category of Excellence in Course Innovation on 18 June 2018. Launched in 2003, the ELTons Awards is the only international award that recognises and celebrates innovation in English language teaching. The book series Get Set, Go! Phonics, published by Oxford University Press (China) in 2017, aims to enhance the phonological awareness and phonics skills of kindergarten children learning English as a foreign language. The judging panel of the 2018 ELTons Awards described the phonics series as “genuine innovation in pedagogy through how words and sounds are introduced.” To find out more about the book series, please visit https://www.oupchina.com.hk/en/getsetgo_phonics. 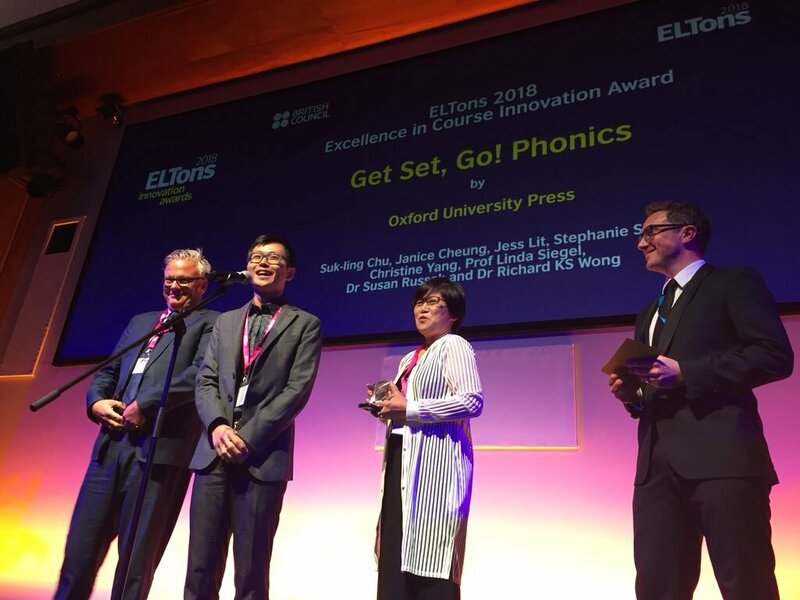 Dr Richard Wong Kwok-shing (2nd left), Assistant Professor in the Department of Early Childhood Education at EdUHK, receives the 2018 ELTons Awards for Innovation in English Language Teaching in the category of Excellence in Course Innovation.